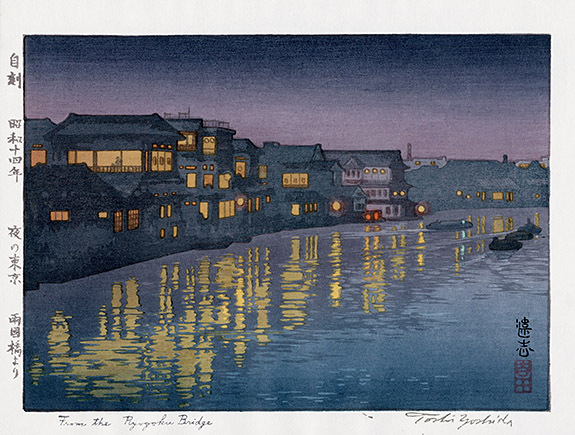 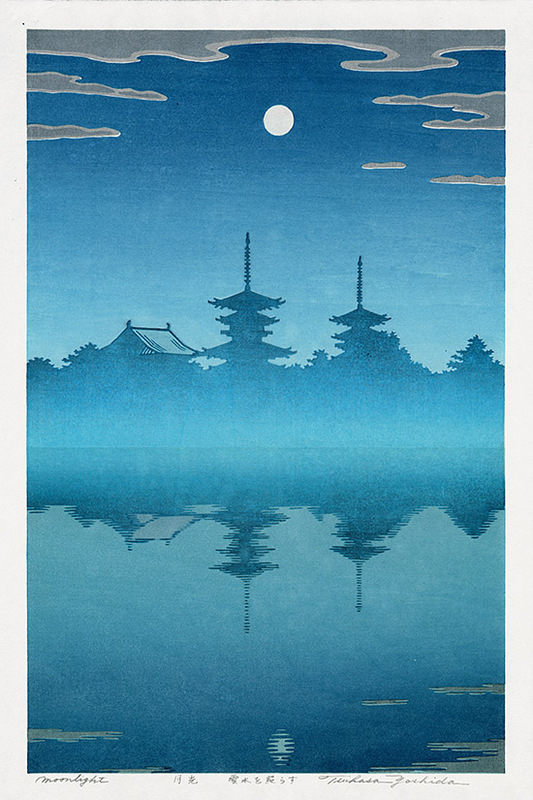 From the Ryogoku Bridge 8 1/8" x 11"
YSH15 SOLD Nikko 8" x 10 7/8"
Linnoji Gardens 8" x 11"
YSH17 $245 Half Moon Bridge 7 7/8" x 11"
Stone Lanterns 7 3/4" x 10 5/8"
Shinjuku 8 1/8" x 10 3/4"
YSH20 SOLD Sangetsu-an, Hakone Museum 8" x 11"
Pagoda in Kyoto 8" x 10 3/4"
YSH22 $245 Sunrise on New Year's Day, Ginza 8 5/8" x 12"
Hikone Castle in Spring 10 3/4" x 15 3/4"
Bamboo Garden, Hakone Museum 11" x 16"
Silver Pavilion, Kyoto 11 1/8" x 15 3/4"
YSH27 $295 White Plum in the Farmyard 11" x 15 7/8"
Two Owls 14 5/8" x 22"
Sea of Clouds 11" x 16 1/4"
Sea of Clouds 11" x 15 7/8"
Way to the Moon 11 1/8" x 15 7/8"
Moonlight 11 1/8" x 15 7/8"
YSH8 $245 Moon Over Bright Mountain 11" x 16"
Monument Valley 14 1/2" x 21 1/2"
Reflect 13 1/2" x 21 1/4"
The Japanese Yoshida family members have been artists, screen and scroll designers and print makers since the 1600's. 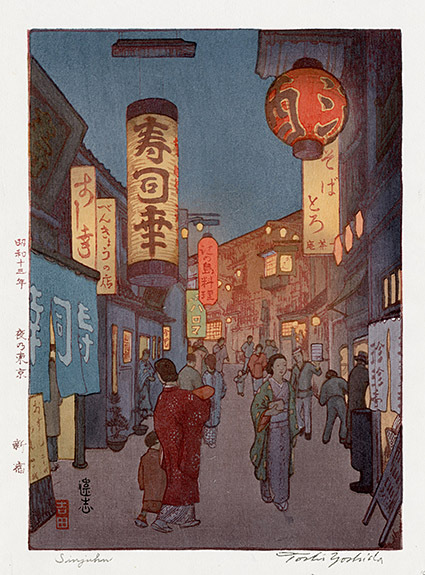 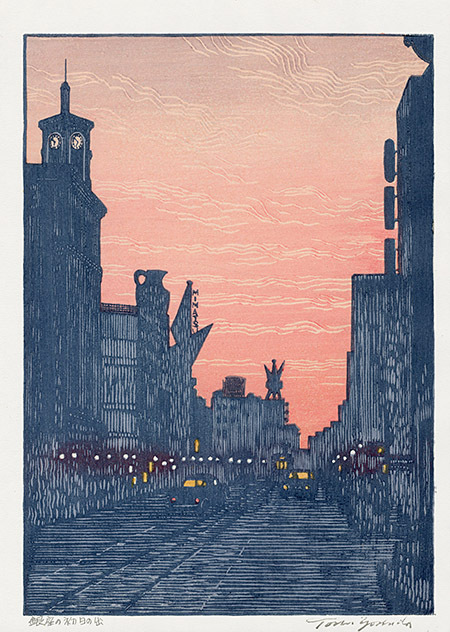 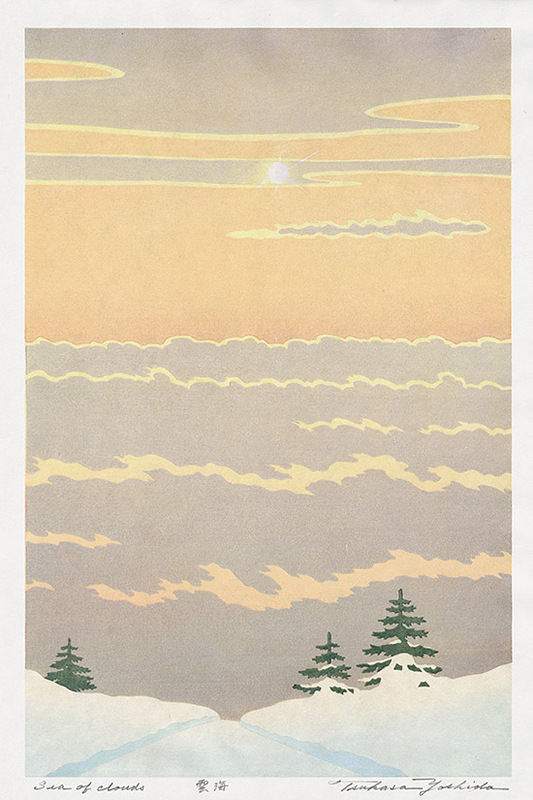 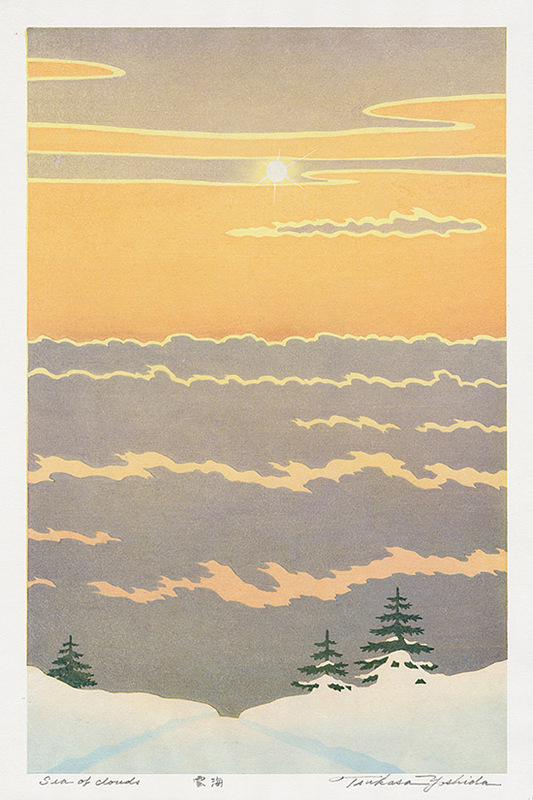 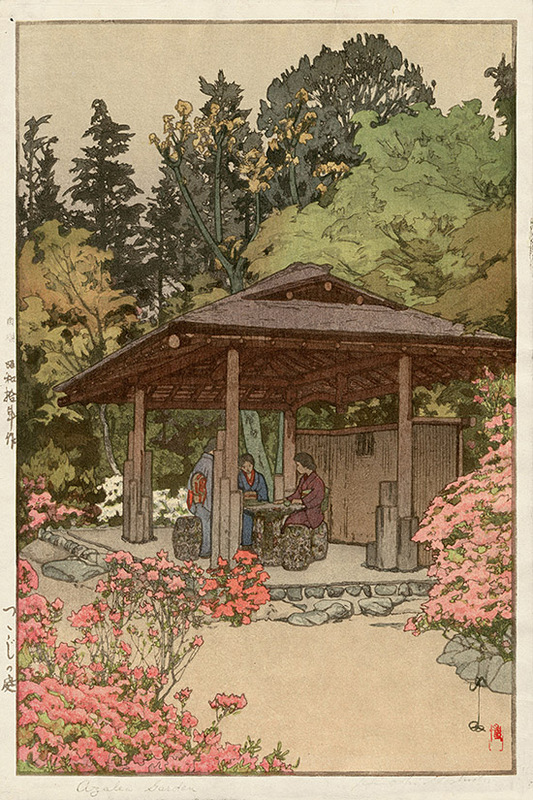 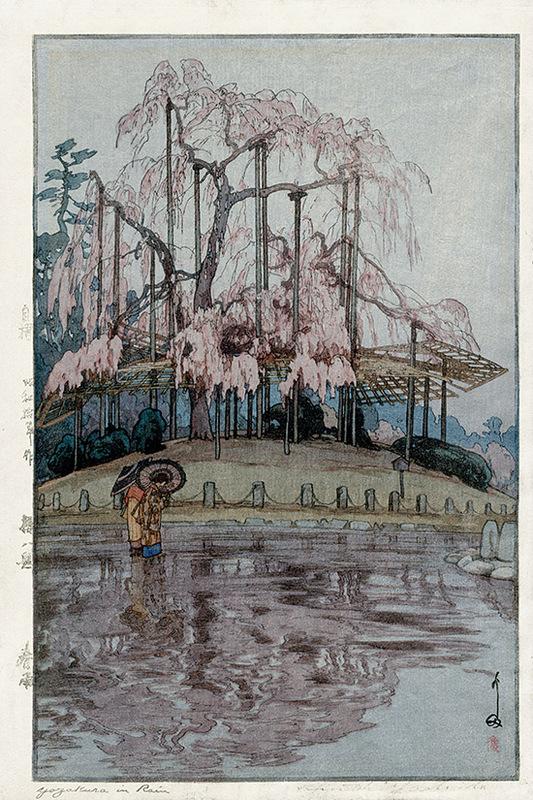 With the advent of the Shin Hanga movement in the 1920's and the focus on creating woodblock prints that appealed to the western as well as the Japanese aesthetic, Yoshida Hiroshi began creating in this style. 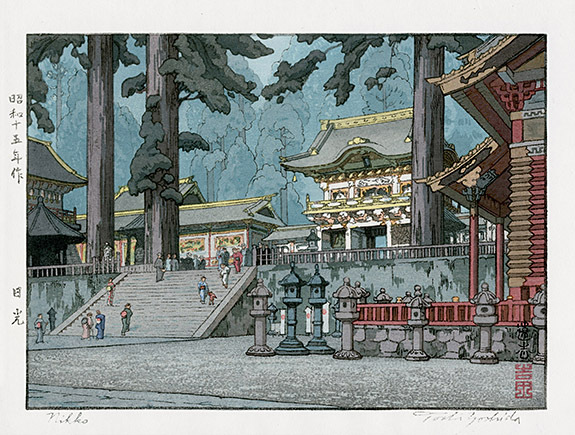 He went on to become one of the greatest artists of the Shin Hanga movement and to inspire future generations of his family. 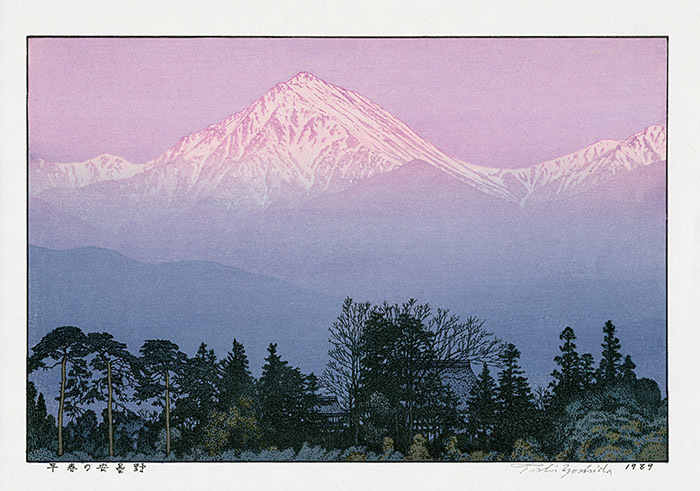 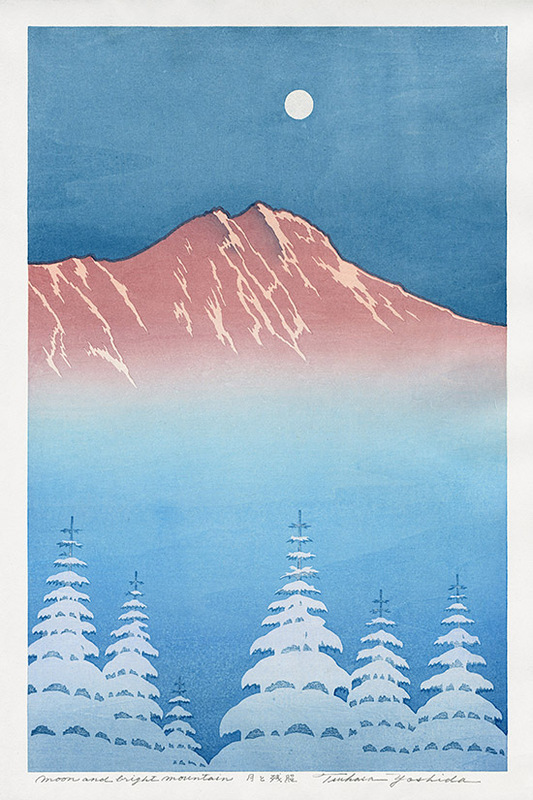 After several visits to the Mendocino Art Center in California, his son, Toshi Yoshida founded the Yoshida Hanga Academy at Miasa, in the Japanese Alps. 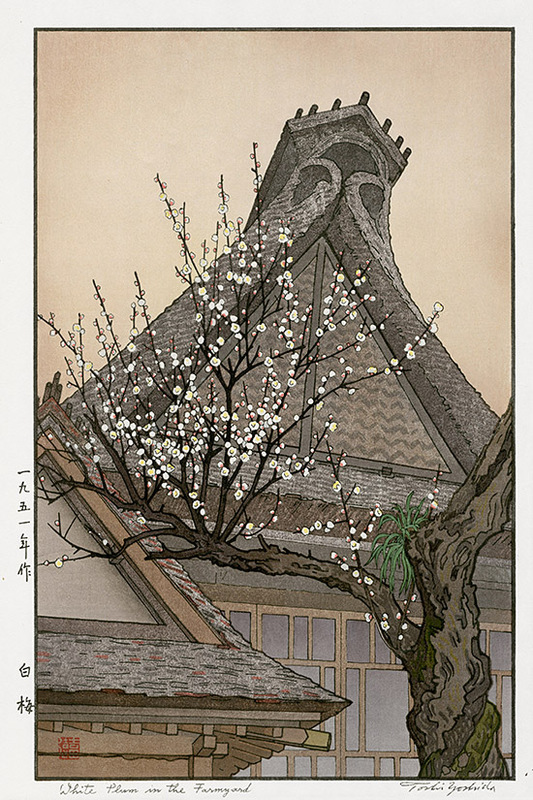 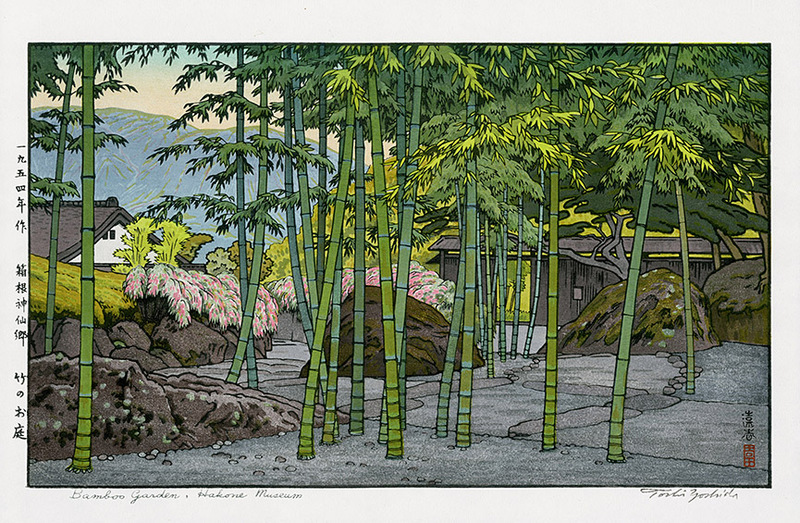 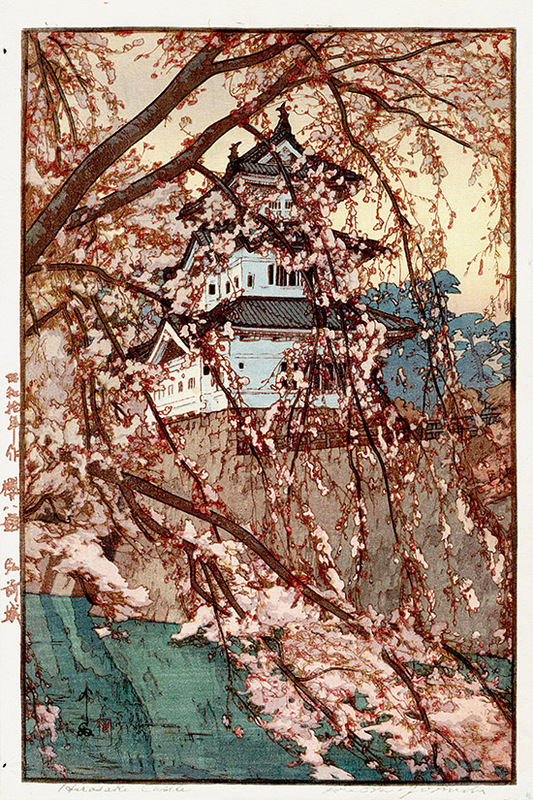 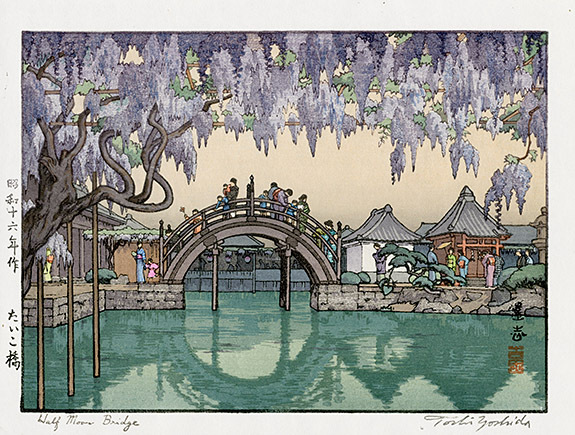 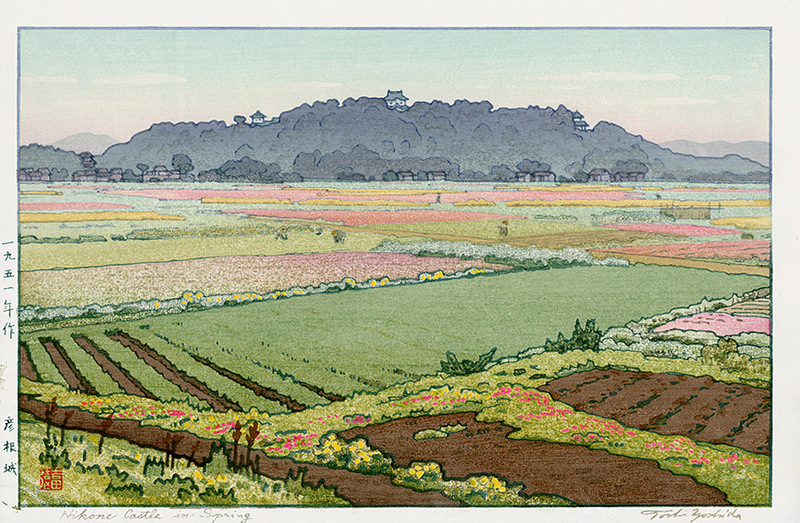 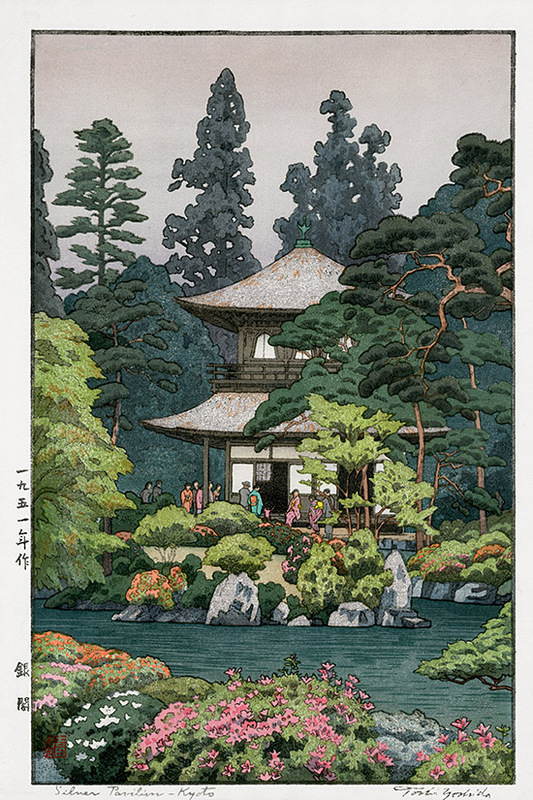 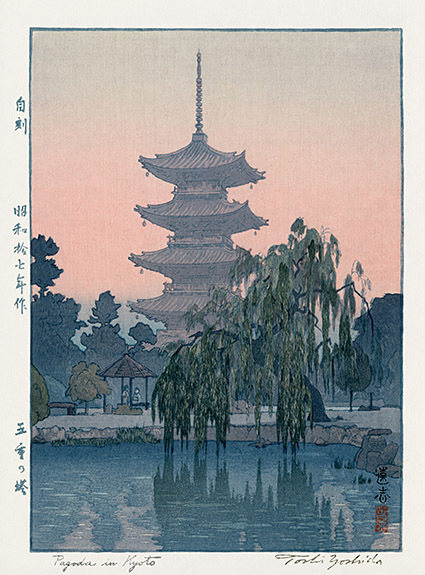 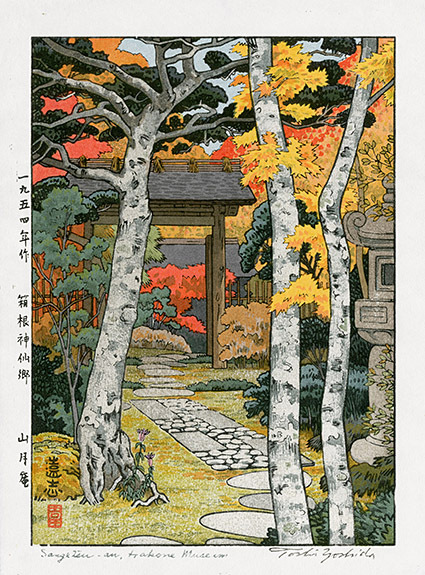 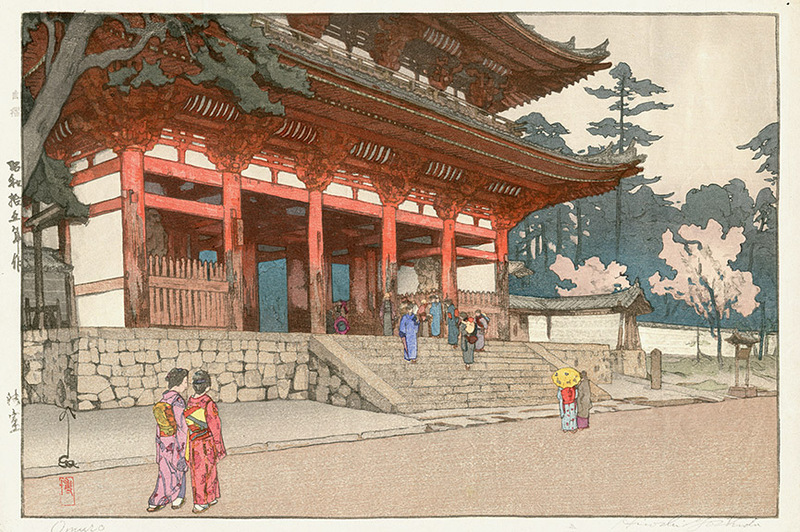 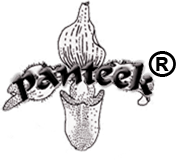 Known as the Bunkacenter, it became the most influential school for Japanese woodblock printmaking. 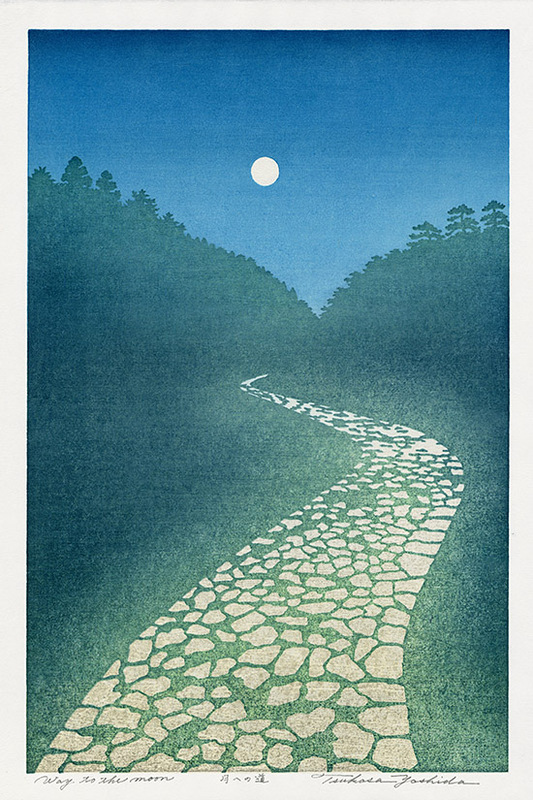 Today it is run by his Toshi's son Tsukasa Yoshida, born 1949. 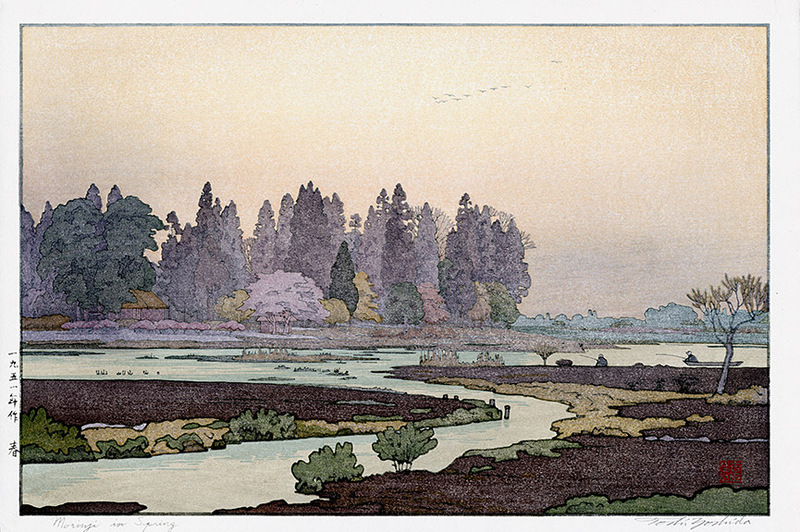 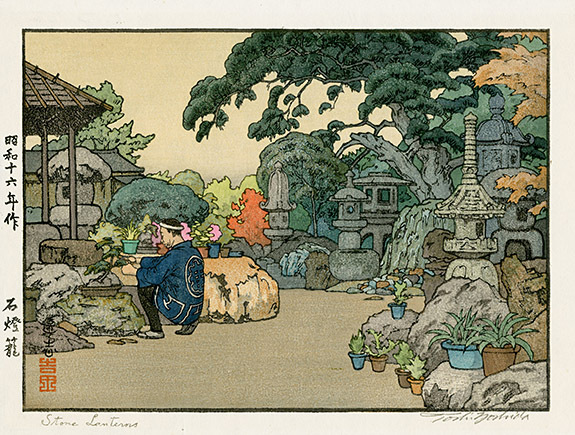 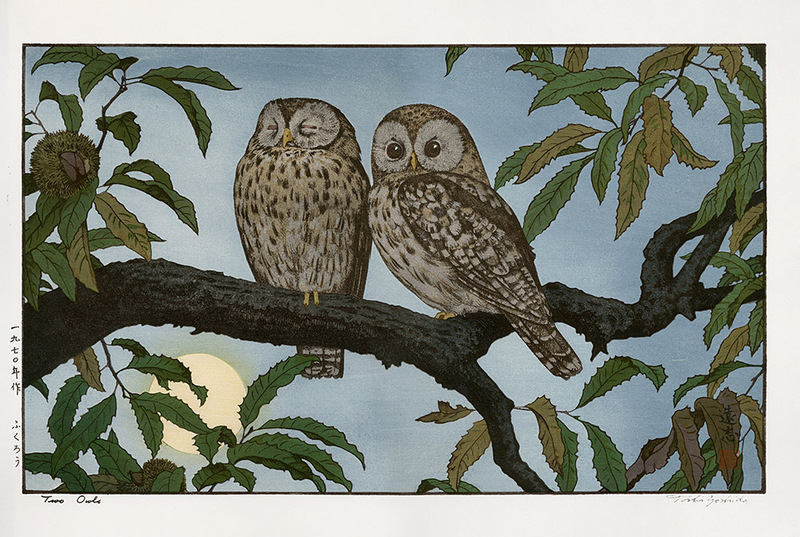 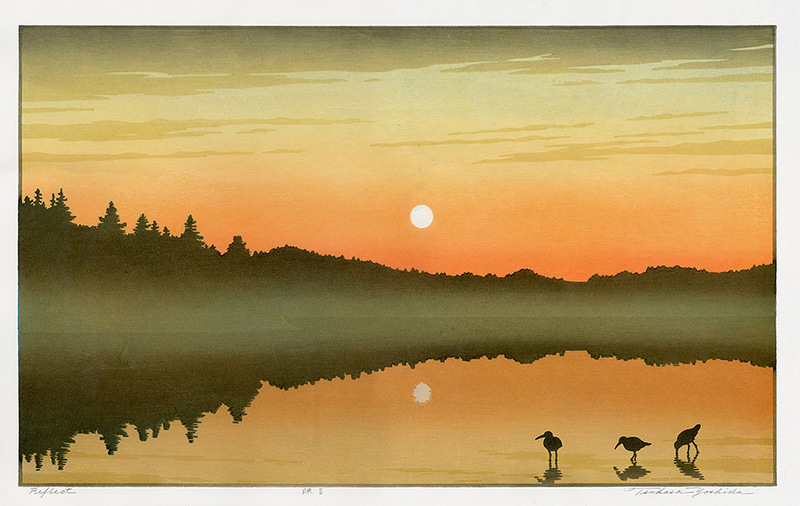 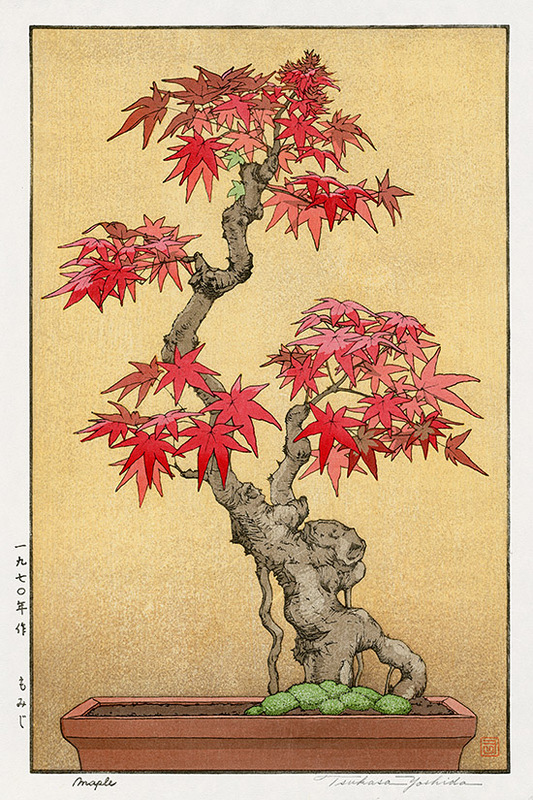 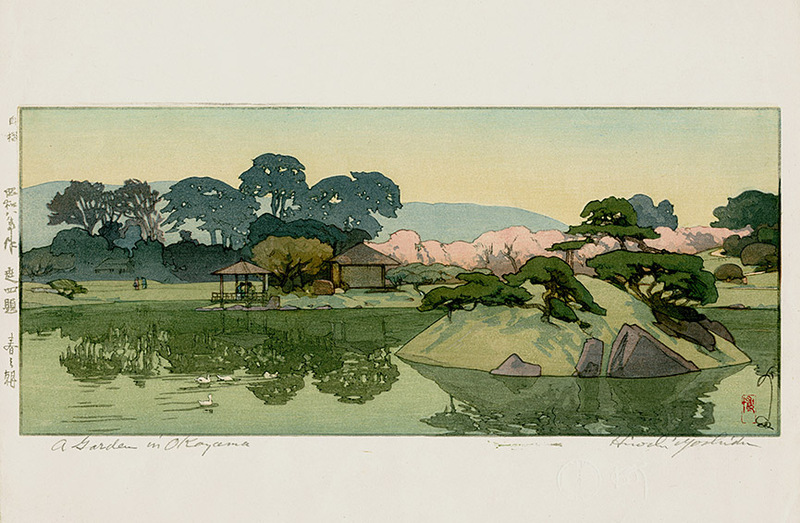 The Yoshida artists have travelled widely, including in the US and Africa, and portray a range of natural subjects rarely found in Japanese prints, including many of America. 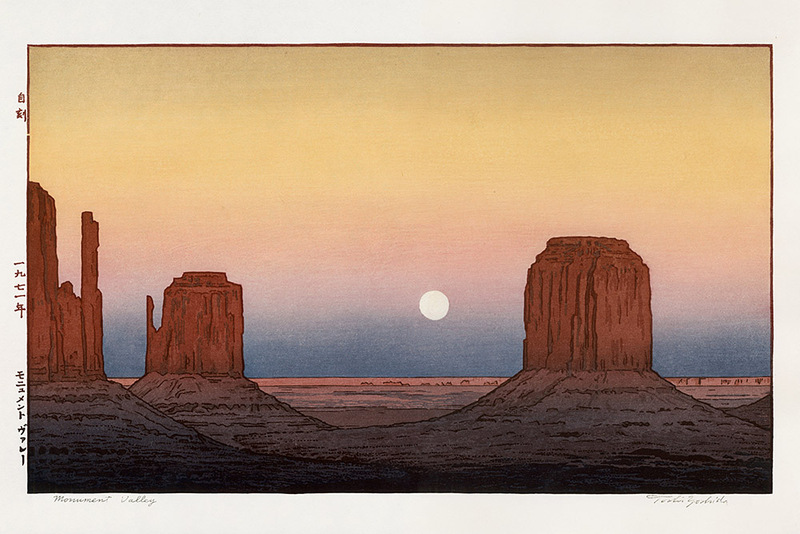 Each print is in excellent condition, never framed and individual sizes are stated under the image. 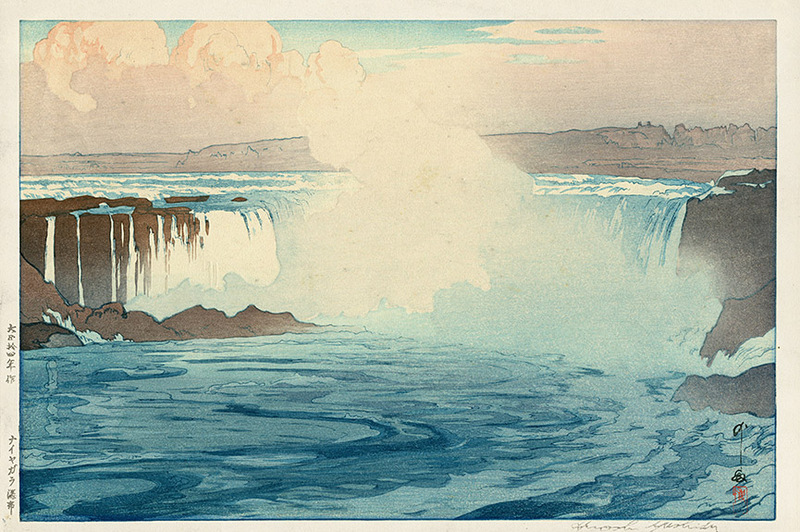 The diverse styles of each artist represent a treasure trove of natural beauty and iconic scenes from all over the world. 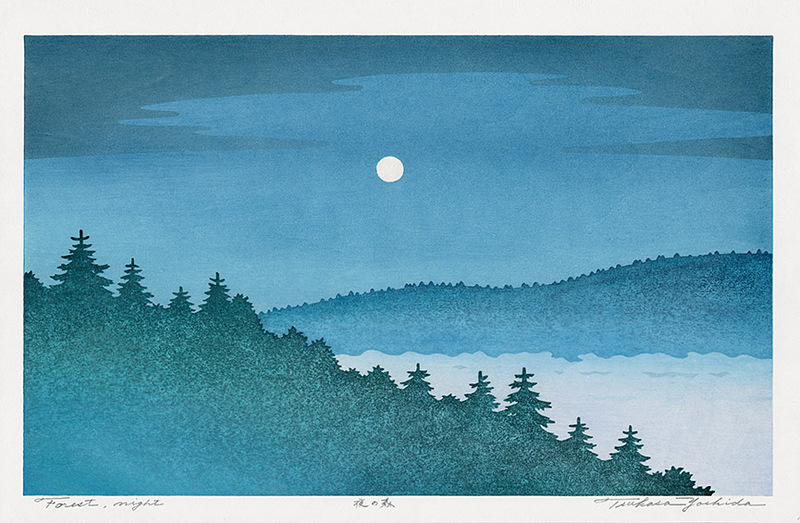 Mount Holyoke College Art Museum, Massachusetts recently featured an exhibition of the artistic legacy of the Yoshida Family. 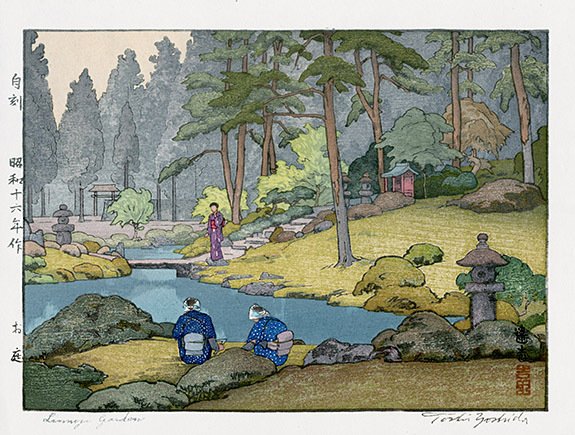 Minneapolis Institute of Art has published Japanese Legacy: Four Generations of Yoshida Family Artists featuring their major exhibition of the family.